If diabetes wasn’t a problem in America before (it was), it certainly is now. 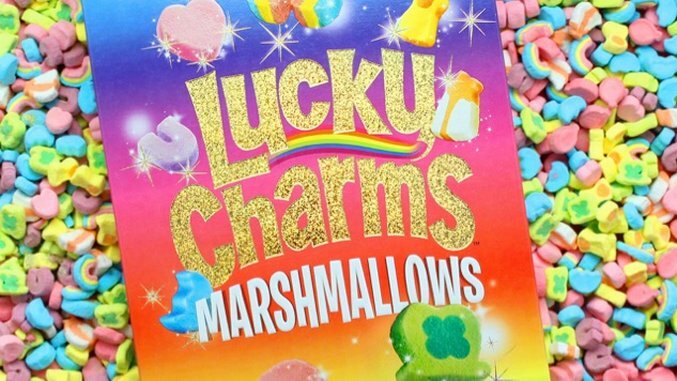 Thanks to General Mills, Lucky Charms will be giving away 10,000 special boxes of the sweet cereal that consist only of the famous marshmallows. In 2015, ten people won a box of marshmallow-only Lucky Charms. This year, Lucky Charms went go big or go home with the contest, hiding 10,000 specially marked boxes of the cereal in stores across the United States. The Willy Wonka-esque tactic is certainly endearing, but the result of finding a winning box will most likely not be a trip to a booby-trapped candy factory with your recently revitalized grandpa. However, if you’re looking for an alternative to coffee, this might do the trick; one serving of Lucky Charms marshmallows contains 85 grams of added sugar. To put that into perspective, the American Heart Association recommends a fully grown adult male consume 37 grams of sugar a day at the most. Senior marketing manager Priscilla Zee explains their brave mission to make as many dreams come true (or cause as many heart attacks, it’s unclear) as possible: “We were overwhelmed with calls, e-mails, and tweets last year, asking for a box of our Lucky Charms marshmallows. So this year we wanted to give them even more opportunities to win.” Of course, there are some things people want, but are better off without. That list includes—but is not limited to—an 11.5-ounce box of pure sugar conveniently fused into bite-sized pieces. According to the Lucky Charms Wiki page, the heart-shaped marshmallow represents the power to bring things to life. We think it may more accurately represent the inevitable cardiac arrest you’re risking by eating an entire box of Lucky Charms marshmallows. We suppose it’s open to interpretation. If you do decide to try to win a marshmallow-only box, you can enter your code on this website to find out if you’re a lucky winner. Happy hunting.